The Value at Cursor command can be used to display information about the character at the text cursor. A popup window displays the character's ANSI representation and its character value in decimal, hexadecimal, octal and binary formats. The dialog box will remain open until dismissed, and will continue to report on the character at the text cursor each time it changes. This command can be especially useful for determining the value of characters which do not have a unique representation in the character set of the current Screen Font. For example, many ANSI fonts use an open box to represent all characters below the value 32 (Space), making it impossible to determine a character's value simply by looking at it. 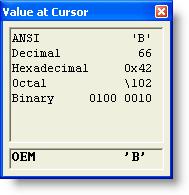 The ANSI Chart and OEM Chart commands can be used to see a full listing of character values for each of these character encoding schemes.